Gratitude is a funny thing. It kind of reminds me of sourdough, it bubbles up and doubles in size, and then you add a little more flour and water to it and it doubles again. It just keeps growing and growing. Gratitude is the same way. Once I think of one thing I am grateful for, ten more things come to mind, and then for each of those, even more swooshes right into my heart. I am grateful my fridge fiasco wasn’t worse. We lost some super yummy left-overs, 2 gallons of fresh milk, salad dressings, mayo, and few more odds and ends, but because I haven’t been grocery shopping for several weeks, there wasn’t a whole lot in there to lose. I’m thankful it was the relay and not the compressor. I’m thankful for the box of rolls, pears, and oranges our Elder’s Quorum brought over the night it all started. My children were able to eat fresh produce while I dealt with all the mess of a broken appliance. I am thankful for the sunshine shining through my window. I have been cleaning and dejunking all afternoon and it warms my spirit to have sun shining on me while I work. I cannot handle dreary overcast days and if I had had one of those while I was dejunking my laundry room it may have done me in! I am thankful for my friends, Amy & Jessica, who are there for me through thick and thin. This week we had a late night escape and I can’t tell you how fun it was to talk and laugh and share and love. I have never had friends in my own ward that are so sister-like and now that I do, I want it for everyone else as well. Mothers need friends to cry and laugh with and I am so grateful for mine. I am thankful for our nightly Christmas devotionals. I love gathering everyone up to sing Christmas carols, talk about a story from Jesus’ life, turn over a picture on our Advent calendar, and read a Christmas story. These few simple things make our Christmas month seem slower and more connected to one another. I am thankful for burn barrels. Today I finally dealt with the counter in my laundry room. It has been a dumping ground for the last several years and I have ignored it by walking by it as fast as I can and casting my eyes anywhere but at the counter piled three feet high with who knows what. We have been taking loads of papers (Coupons that expired in May 2008, piles and piles of mail, and tickets from a concert Blythe attended several years ago! Really, how unorganized can I get?) out to burn and have made quite a dent in the mess. If I had to put those in the garbage, I would have filled it right up! 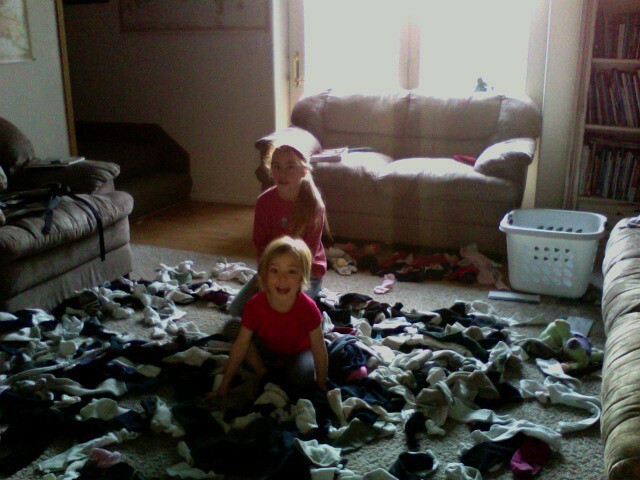 Speaking of disorganization, I have a sock basket that is overflowing. I love socks, but I hate matching them and I always seem to have only one come through the laundry. It drives me bonkers. Today I told the kids I had a pay job (rare treat at our non-allowance house) and they jumped right on it. 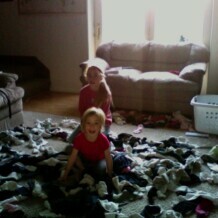 Two cents for every sock they match. This is going to be the best couple of bucks I have ever spent! I am grateful for my husband. As a dear friend just told me today, “You know what it is to love deeply and to be loved deeply. You know what it feels like to have someone in your life who would do anything for you. You have what all of us want.” Sometimes I forget how blessed I am to have the marriage I have. Sometimes I forget what my parent’s marriage was like. Sometimes I forget how empty and depressing my life could be if I didn’t have him in it. I adore him and am so, so grateful for him. I am thankful for the lessons he teaches me, the safety I feel in his arms, and the peace His presence gives me. Last week during the advent calendar sewing session, I called him and bawled my eyes out. I said, “I am so stupid for even thinking I could do this! I am wasting our money by buying fabric for a project that is too hard! I should be home making dinner for my family and instead I am sewing something that is going to turn out ugly and not even be useable! I am so sick of being me! I don’t know what to do! I don’t know if I’ll ever be home. I am just. so. frustrated!!! !” Granted, I was at my wit’s end, VERY PMS-y and my hormones were topsy-turvy…but really what was he supposed to do with all of that? He could have said “Well, how much did you spend on it?” He could have said “Well, don’t finish it then, doesn’t matter to me.” Instead, he said “This is great! You get to learn how to do something new, to improve your sewing skills.” I said “What sewing skills!! !” and he calmly replied, “You are learning. You are overcoming your fears and you have a good friend to help you. Enjoy your time with Kat and I’ll take care of things at home. You can do it and if it doesn’t work out, it’s okay, you will have learned something.” Of course, that whole conversation got me crying all over again. And then I thought to myself “Tracy, you are the luckiest woman alive. Go home and love on him.” And I did. I am grateful for my mom. I can call her day or night and she will help me figure out a recipe, a grammar issue, a math problem, or what food I can save and what I need to throw out. She is am amazing grandma and a wonderful friend to me. I love her and am thankful she is part of my life. I am grateful for all the people who came and got sourdough start from me this week. I was drowning in it and couldn’t bear to throw it out. I gave some away to nine or ten people and so far I have heard that all their bread turned out delicious. Yippee! I love match the socks day!!!! Seriously, they might need a little more motivation than that. Tell them I will pay them a nickel for every pair they put together. But tell Annes they have to match! I raised it to a dime afterwards so Fisher could earn a whole dollar instead of .20 for the ten pairs he did. Keziah is up to $2.00 and Annes is at .40. OH, I should have replied over here. How fun! Well, then, I’ll match it!!!!!! !